Okay, so you put a picture frame up on the wall. You get out your level (everyone should have a level in their house– no discussion), slap it on top, adjust the picture frame so it’s level, and walk away. 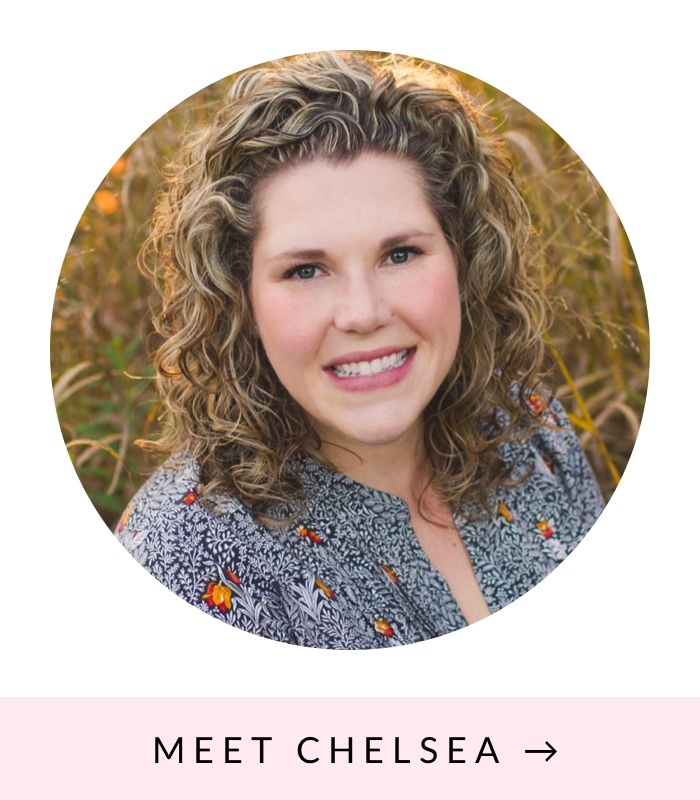 BUT 15 minutes later your husband (substitute “child” for “husband”, if necessary) goes out into the garage and, unintentionally, SLAMS the door to the garage, shaking the wall, and causing your perfectly level picture frame to be level no more. Never fear though! My trick will help your pictures maintain their state of levelness. Are you ready for my secret weapon? I love these little things. They’re rubbery so they grab the wall, and they’re clear so they don’t mark up the wall. 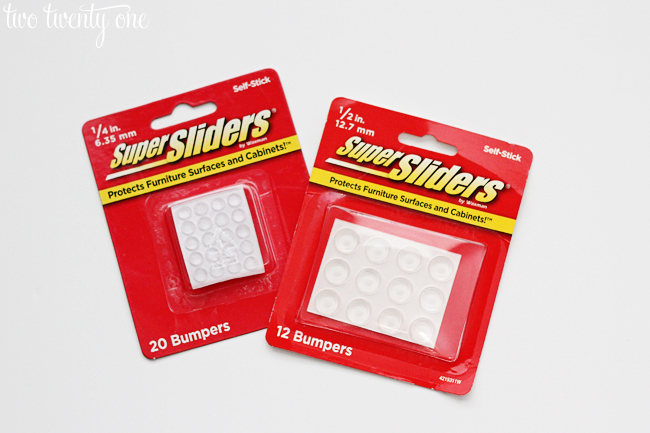 You can find cabinet bumpers at big box stores or here. You simply stick two bumpers onto the two bottom corners of your picture frame, so one bumper per corner. 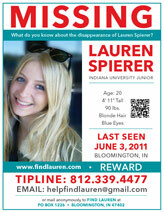 Hang your picture frame. Slap your level on top. Adjust until it’s level. Then give the bottom corners with the bumpers a little push. Note: Do this at the same time with both hands. I was holding my camera when I took this photo so my right hand was occupied. Does this method mean I never have to go back and readjust my picture frames? No. Sometimes I will notice that a picture frame is a little off so I’ll make the adjust. But I have to fix picture frames with bumpers less often than those without bumpers. I know some people use poster putty but that’s not really plausible with my walls since they’re textured. The putty would get into the little grooves so I’d have to scrub the walls to get the putty off. And some putties have stained my walls in the past. So there you have it! How I keep my picture frames straight so I don’t have to constantly adjust them. Brilliant! I never would have thought of that! 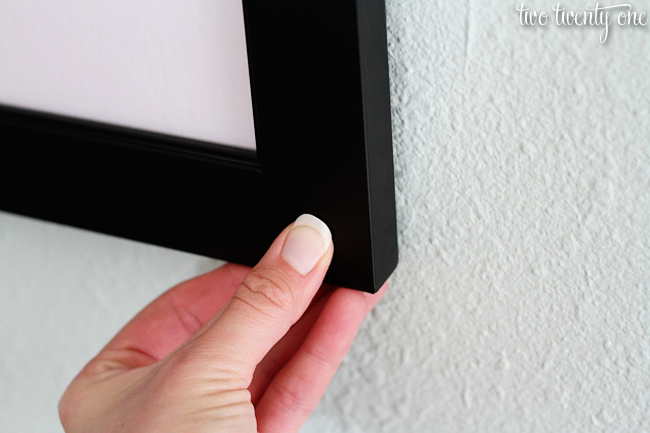 I have been having this issue with some large framed posters in my office – this is such a wonderful solution! I will be going out for these ASAP! SO smart! What a great fix that won’t harm my walls! Brilliant idea! Once I get around to actually hanging things on my walls (it’s only been two and a half years, don’t judge) I’ll have to try it out! I have a laser level, it’s the best thing ever! I like this tip, my pictures always move after a while. Thanks! Clever! I always use hot glue. Bumpers are way easier! This is a good idea. I’ve been using the adhesive backed Velcro. Where did u get the cherry print??!! Love that!!! This is so smart! I’m always adjusting our pictures around the house and yep, they never stay put! Thanks for clueing us in on your little secret! So smart! My cat is constantly using the frames on the wall as a toy. I will have to try this and see if it helps. Such a great idea! I’ve got some shifty frames, so I definitely need to do this! A free option is use the rubbery glue that holds an address label on your magazines, or from the junkmail that you get. Peel off the fake CC, and use the lil sticky strip that held it in place. Great solution! I am so using it. The putty never works… you can see it behind the picture and it never really adheres well so it doesn’t really hold at all. Thanks for the tip! The sliders is really helpful for us. The wall poster kept it straight with the of sliders. I use a dried glob of hot glue on the corner of the frames and it works well too! 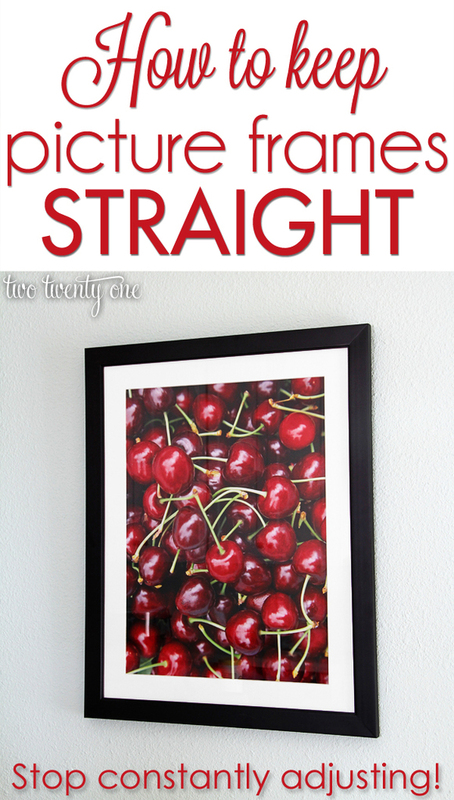 I love that picture of the Cherries…where did you get it! I love that you mentioned that this material will not stain the walls compared to the other product that you’ve used before. I will keep this in mind so that my decorations will not be looking crooked at times. As of now, I am still looking for picture frames that I will be using for our family photos since I plan to decorate one wall full of pictures.